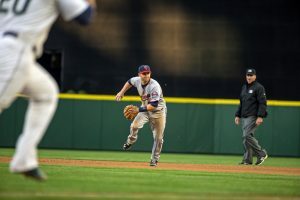 A turning point, as described by Minnesota Twins starting second baseman Brian Dozier, came when he recognized he was shortchanging his baseball teammates at the University of Southern Mississippi. Brian was having a good season on the playing field his senior year at Southern Mississippi. At 30 games into the season he shattered his collarbone trying to make a play at shortstop. It required surgery. The injury would require 12 weeks of rehabilitation which would take him up to the College World Series. The team was an average team; but late in the season, they went on a miracle run. “I was a leader on this team,” shares Brian, “but I was always rehabbing and not focusing on leading the team when it needed me most. To be honest, I felt Christ was telling me I was still a part of the team, and they still see me as their leader rather than someone that is hurt.” Brian still did his rehab, but he stepped up his leadership role to cheer on his teammates and give the team his support. It was a lesson of humility as Jesus said, “For everyone who exalts himself will be humbled, and he who humbles himself will be exalted.” (Luke 14:11, also Matthew 23:12) Also, the Bible says Christ “did not come to be serve, but to serve.” (Matthew 20:28, also Mark 10:45) Brian calls this experience a turning point for him as a leader and as a Christian. Learning biblical lessons was nothing new to Brian Dozier who grew up in the small town of Fulton, Mississippi, to Mike and Jan Dozier. Along with his parents and his older siblings, Leigh Anne and Clay, the Doziers were and still are active participants in their local church, Fulton Church of Christ. Another member of the family who was very influential in Brian’s spiritual growth was his grandmother, Lynette Dozier, better known as MeMaw. “Looking back, it is truly a blessing growing up in a Christian home,” comments Brian. There were tears shed, but they were tears of joy. Brian and his mother went back into the church, and he was baptized. He said, “It was the best decision I made in my life.” For Brian, it has been a wonderful journey of faith ever since. Playing baseball is a dream come true, and something Brian, a 2015 American League All-Star, loves doing. But he found out quickly it was not who he was. It all changed for him in his rookie season in 2012. Brian attended hometown high school, Itawamba Agriculture High School in Fulton, Mississippi, (approximately 3800 population) where he played on varsity in baseball (4), football (3), golf (2), and basketball (1). He was a two-time All-Stater in baseball and “Player of the Year” in north Mississippi in 2009. Brian went on to play baseball at the University of Southern Mississippi in Hattiesburg on scholarship, and he finished with a career .355 batting average. He was drafted in 2009 by the Twins in the eighth round. Brian, the Twins 2013 Defensive Player of the Year, finished his degree in marketing after his first minor league season in 2009, having turned down the Twins invitation to go to Instruction League in the fall. He had promised his parents he would get his degree. Renée has a degree in International Business with a minor in Spanish. They make their off-season home in Hattiesburg. Excellent and most inspirational expose here sir. What salt and light for a world badly in need of it.